The #LoveYourUnique contest has been extended! We wanted to give everyone an opportunity to participate so we added on two weeks! The contest now ends August 14, 2013! Good luck!! Bonjour Latte Lovers! It’s about that time again! 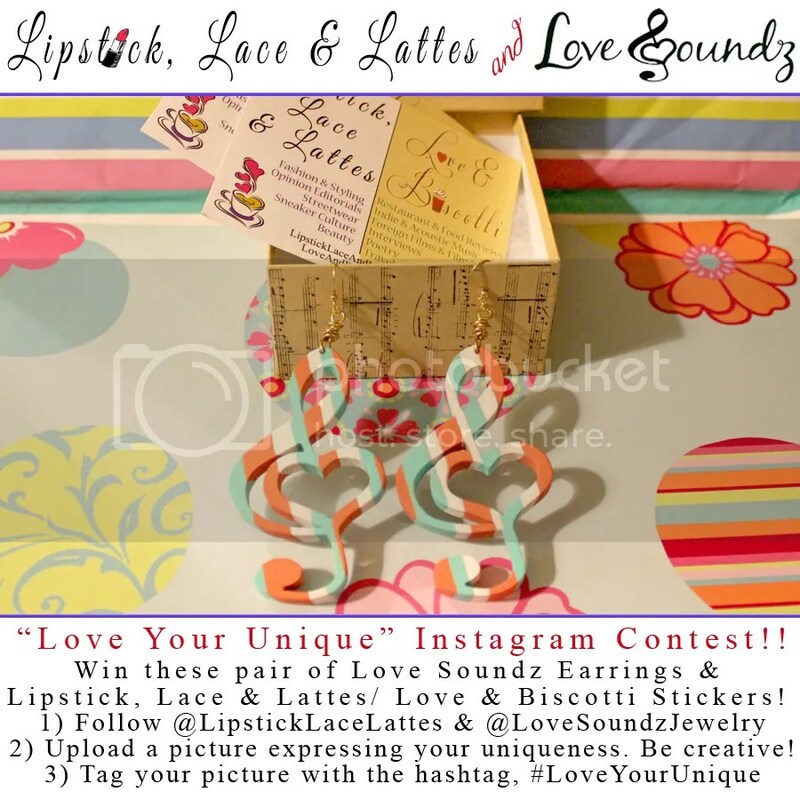 Lipstick, Lace & Lattes has partnered up with the creative, hand-crafted and music-inspired jewelry brand, “Love Soundz Jewelry,” to bring you another amazing contest! Love Soundz Jewelry – as well as Lipstick, Lace & Lattes – is all about expressing your individual creativity, uniqueness and passion for the things that you love. We take pride in showcasing our pride in fashion and style – as well as all of the other outlets that drive, motivate and inspire us – and we want to encourage you to do the same! 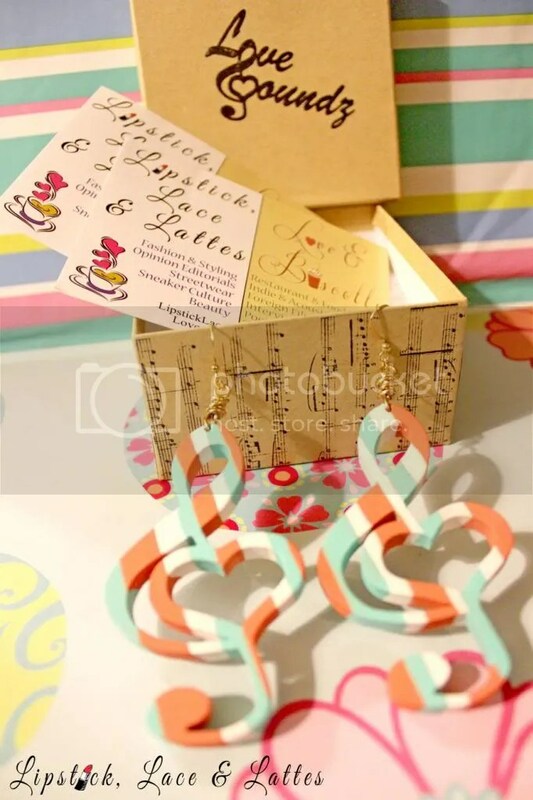 Therefore, we are offering one of our readers the exclusive opportunity to win a pair of hand-painted Love Soundz “Love Note” earrings – that comes complete with its own Love Soundz jewelry box – and we’re throwing in two Lipstick, Lace & Lattes/ Love & Biscotti stickers as a bonus! To enter, all you need to do is simply follow the steps below – which requires you to have an Instagram account – and cross your fingers! The contest officially ends on Tuesday, July 30th – whereas we (along with the creator of Love Soundz Jewelry) will pick a winner that best expresses how they “Love They’re Unique,” as well as follows all of he official rules. Good luck! Note: Contest open to U.S. residents only. 3) Tag your picture with the hashtag, #LoveYourUnique and make sure your profile is public! We won’t be able to see it if its private. That’s it. Good luck! Located in Southern Cali, Love Soundz is a jewelry company providing fashionable handcrafted pieces for any environment or engagement. Love Soundz was founded on the idea of “exclusive designing”. This has everything to do with the way we work. Our jewelry is completely inspiration-driven, which permits us from replicating any of our pieces! Ultimately, we are giving our customers the same feeling of having a personal fashion designer. ← [Spill The Beans] How Attached Are You To Your Phone?